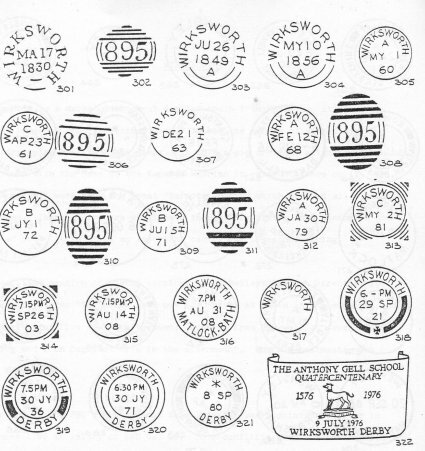 Figures 299 and 300 show the two types of "Penny Post" stamps recorded used from 1815 to 1833. The receiving houses at Matlock Bath and Matlock used the handstamps as Figures 163 and 164 respectively. Figure 301, the first dated stamp, was issued on 20 March.1830 and is recorded used until March 1849. It is recorded in black and blue. From 1840 to 1844 it is recorded in conjunction with a maltese cross cancelling the postage stamp and from 1844 to 1849 with Figure 302 cancelling the postage stamp. Figure 302 is recorded until1869. Figure 303, was issued on 26 June 1849 and is recorded, in black, blue and blue-green, until April 1856 either as receipt stamp or in conjunction with Figure 302 on outgoing mail. Figure 304, was issued on 10 May 1856 and is recorded, in blue, until 1858. Figure 305, was issued on 1 May 1860 and is recorded used, with Figure 302, until 1869. Figure 306, was issued on 26 July 1861 but has not been recorded used. Figure 307, is recorded as a backstamp on the date shown. Figure 323, was issued on 23 January 1978 but has not been recorded used.